Research has shown that the quality of the school climate may be the single most predictive factor in any school’s capacity to promote student achievement. When students are mentally healthy, they are able to learn, maintain positive relationships, and cope with challenging situations. Enhance student understanding, attitudes and behaviors that promote health, well-being and human dignity. In this new leadership group, we will share information and discuss issues regarding mental health education and social-emotional development. 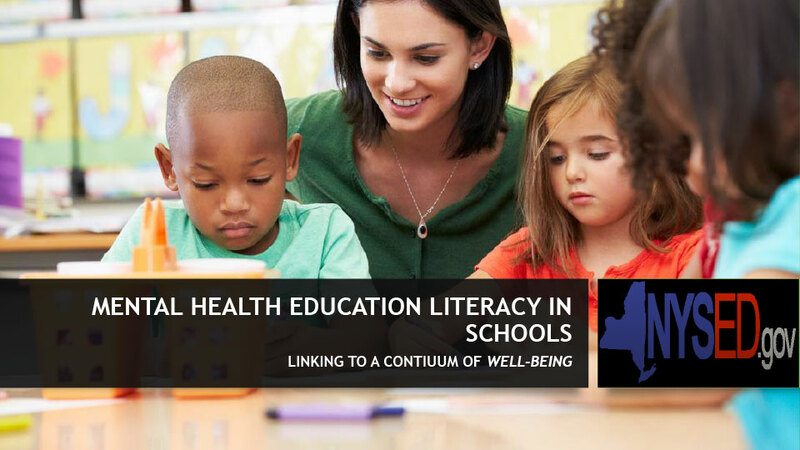 The goals of this group are to develop collaboration between districts in the region to support high-quality K-12 mental health and wellness instruction and support, while also sharing important information regarding the regulations, guidelines, and initiatives from NYSED. We will have community experts assisting in the presentation of information. This CoSer provides all curriculum materials needed for K-5 classroom teachers to meet the NYS Health Education Standards, health-related mandates and functional knowledge content requirements. Training is provided and available to new and veteran teachers currently employed in districts that utilize our health kits.